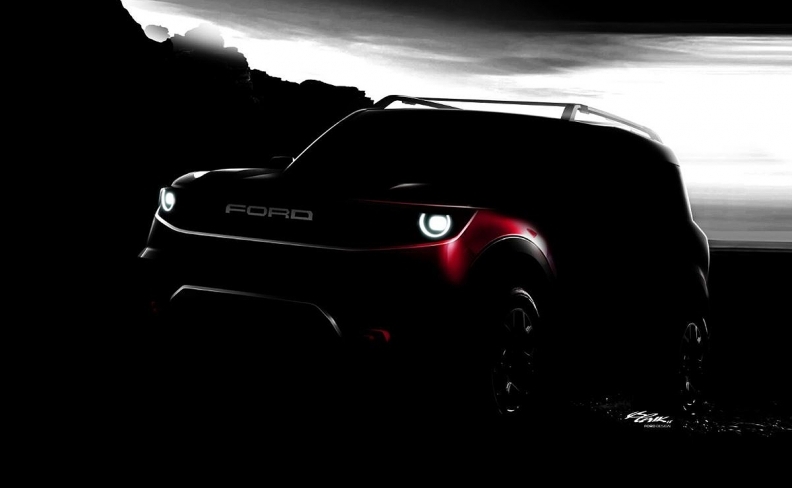 Ford said it plans to introduce a small off-road SUV as part of a plan to replace 75 per cent of its North American lineup by 2020. The company has not given the vehicle a name yet. DETROIT -- Ford Motor Co. on Thursday said it would replace more than 75 percent of its North American lineup and add four nameplates within the next two years. It said the product blitz would reduce the average age of its fleet to 3.3 years from 5.7, giving it the industry's freshest lineup among full-line automakers. South of the Canadian border, Ford said it aims to supplant Toyota Motor Corp. as the top seller of hybrid vehicles in the United States in three years as part of a dramatic reshaping of its lineup to focus heavily on utility vehicles and pickups. By 2020, Ford expects pickups, utilities and vans to be 86 per cent of its sales, up from about 70 per cent today. It will have eight utilities in North America, up from six today. Ford plans to offer a hybrid variant -- either a traditional hybrid, a plug-in hybrid or both -- on every new utility it adds or redesigns moving forward. The automaker expects to overtake Toyota in hybrid sales in the United States by 2021. Ford is currently No 2. Farley said Ford was looking to target brands such as Jeep and Land Rover but with a different customer in mind. "Both of these vehicles are for a growing group of people who want to simplify their life and get out there with their family and friends," he said. "For Jeep, that's rock-crawling in Moab. For Ford, our people want true off-road vehicles that are comfortable at high speeds. They don't want SUVs that look like doomsday vehicles or have spartan, government-issued interiors." In addition to off-road SUVs, Ford has said it plans to unveil a Mustang-inspired battery-electric SUV, tentatively referred to as the Mach 1. "That vehicle is going to be famous without having to shoot it up in space," Farley said, in a reference to Elon Musk's stunt that launched a Tesla Roadster via a SpaceX rocket last month. Ford is working to make its vehicle-building process more efficient. It expects to achieve US$4 billion in engineering efficiencies over the next five years. Among those efficiencies, it's reducing by 20 per cent the time it takes a vehicle to go from a sketch to the showroom, and it's improving its plant changeover time by 25 per cent. Roughly 80 per cent of Ford vehicles are built using only 10 to 20 per cent of combinations, he said.